Papa. That's what my boys have christened my dad. I still call him Daddy most of the time. He's not a big talker, but he loves to fish. One of these days I'll get around to posting a few really old pictures on here out of my scrapbook. You know, in my spare time? I have so many memories of fishing with my Dad and hopefully the boys will enjoy it just as much. Oh, and maybe even the girls too! Fishing rules! 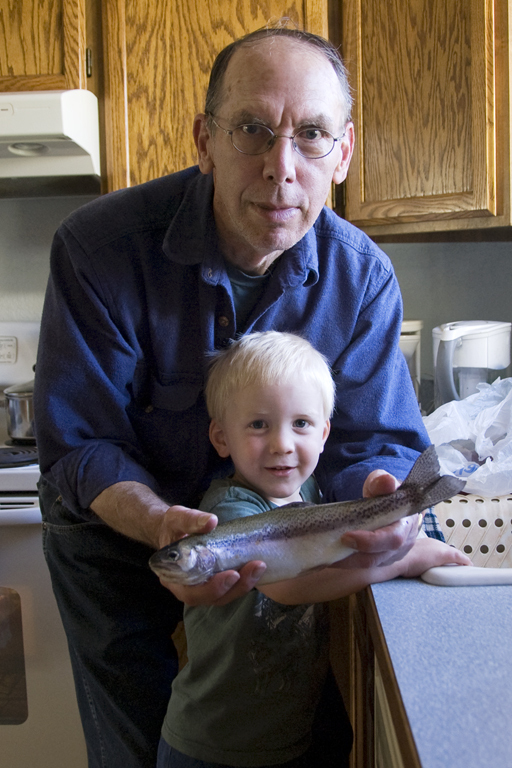 While I can't really go fishing with him this year for Father's Day, I have hopes that in a couple more years I may be able to go again! In the mean time I'll probably get him a card with a fish on it. And we might have fish for dinner if he's caught any lately! And where will I get my fishy card? From Tiny Prints new card site called Treat. If you've been around here for any length of time I'm sure you've noticed I kind of have a love affair going with Tiny Prints. See, I'm one of those people who really likes stationary and cards and especially getting things in the mail. And Tiny Prints just has such cool stuff! Now they've gone and created a site that's entirely dedicated to greeting cards and it's called Treat. It functions just the same as it always has, with cool customizable cards that you can have sent to you or directly to your recipient. Treat is giving away 10 tokens good for one card each. So if you'd like to make some special Father's Day cards, birthday cards, or just Thinking of You cards please enter by leaving me a comment below. What do you call your dad? Also: You can get your first card free by signing up and using the code: FREETREAT at checkout. Giveaway will end next Monday the 4th at midnight. Please be sure I have a way to contact you! I have been compensated by Treat for this post, but all memories and opinions are my own! Find Treat on Facebook, Twitter, Pinterest, and Google+. can't wait to check out treat! My dad was always Daddy. ;D I adore tiny Prints just like you!! I called my father Daddy even as an adult. He's gone now and I miss him so much. I call my dad.... Dad, or Hey you! HA!